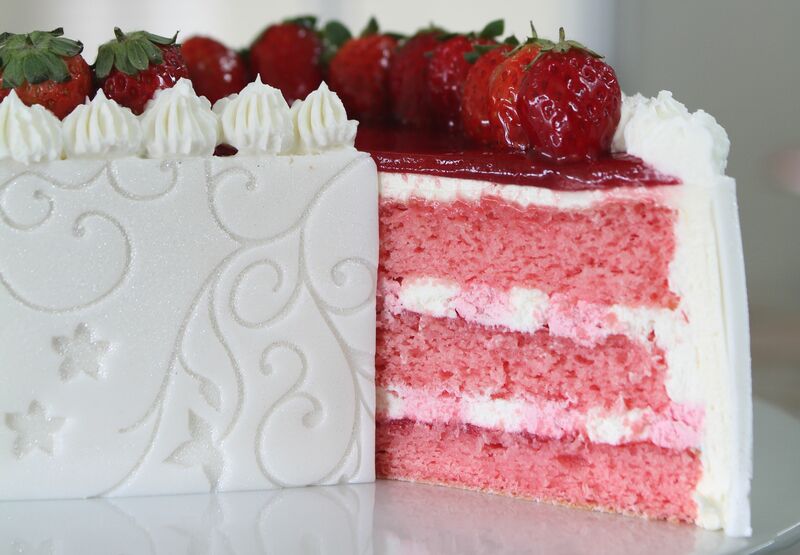 Slice into this cake and you’ll find beautiful layers of strawberry cake. Add this cake to your party table for a lovely touch of red this coming Christmas. Preheat oven to 180°C. Sift flour, cornflour and ground almond together. Whip eggs and sugar until thick, pale and fluffy. Add strawberry paste. Fold in sifted dry ingredients and then add warm melted butter and mix thoroughly but lightly. Pour the mixture into 3 ring moulds measuring 15cm (6”), smoothen with spatula and bake for 8 minutes. Cut each baked sponge into a heart shape. Split the vanilla pod and scrape the seeds into the cream and whip together until soft peaks form. Whip cream with strawberry paste until soft peaks form. Blend strawberries and cook with sugar. Add strawberry paste and gelatine. Allow to cool and chill until set. Boil sugar and water until sugar dissolves. Add strawberry paste. Allow to cool. Using a pastry brush, apply the strawberry syrup on each layer of sponge. Then spread a thin layer of strawberry jelly on the base sponge layer and pipe alternate lines of vanilla cream and strawberry cream to cover the sponge. Top with a second layer of sponge and repeat. Cover with the remaining layer of sponge and spread a thin layer of strawberry jelly on top. Cover the whole cake with vanilla cream. Spread a layer of strawberry jelly on the top and cover the sides with a layer of rolled fondant. Decorate with vanilla cream rosettes and glazed strawberries.